This month we were set the challenge of recreating an outfit from our favourite celebrity. For me this was a total no-brainer, I am in love with Victoria Beckham who is pretty much one of the best known style icons! I had to do it and I knew just what dress to feature. Now you will have seen me teasing you on Twitter about my version of the VB tent dress. They aren't exactly the same, obviously, and I don't think I could pass as Victoria (as much as it pains me to say) but I have taken the elements of the textured drop waist dress and shown how this translates into plus size. Here is how I wore it! I teamed it with my Rocco bag and sunnies I got free with this months Cosmo, they're actually quite nice, I would recommend them anyway and they come in 3 different styles. Have a look when you're next in Sainsbury's! 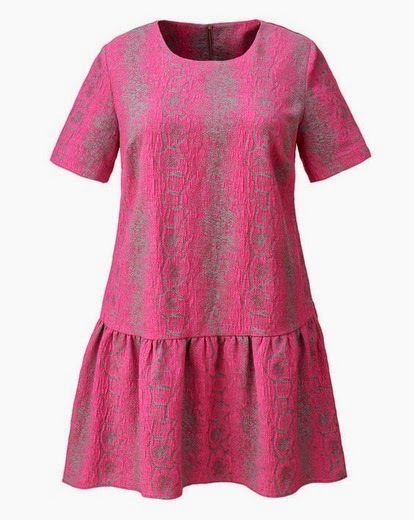 I am in love with this dress, I just think it suits me so well in terms of the pattern and texture and the fit is altogether quite flattering. I would recommend sizing up for a true oversized look if that's what you're going for as the dress fits true to size. Here it is from the back, there is a concealed zip and you can see the dipped hemline at the back which covers your backside just perfect! I can't wait to see the other ladies' posts, I really like challenges where you replicate a celebrity but make it accessible particularly to plus size. It just further shows the amount of options we have available to us. Thanks for reading and be sure to check the other lovely bloggers out on the links below.